Welcome to all of the new Banner 9’ers! On February 1, we officially transitioned to Banner 9. We are very excited to offer Banner 9 to campus, and we are grateful for all of the time and energy provided by our technical team, functional stakeholders, and so many employees across the institution. With any software transition, there are likely to be a few things that do not work quite right. Bugs, whether new or outstanding, will be addressed in Banner 9. Over the last several weeks, staff have continued their development and testing work. We are on track to meet the goal of transitioning to Banner 9 on February 1. Information Services is working with Business Affairs and the Registrar’s Office to prioritize work so that we can meet this goal. On Friday, Jan. 25, we received important fixes for Banner 9 pages in Payroll external reporting, time entry, and HR faculty appointments. As we approach the end of January, we will continue decommissioning forms in Banner 8. Once February begins, we will be prioritizing and addressing any outstanding issues after that point in Banner 9. University of Oregon staff have been working hard over the last 23 months to complete the move from Banner 8 to Banner 9. Our goal was to finish this work by December 31, and we have decided to extend the timeline by one month. By January 15, we will have transitioned the majority of the forms. Banner 8 forms will be disabled after they are successfully moved to Banner 9, and we will update the list of forms available on the Banner 9 blog at https://blogs.uoregon.edu/banner9/banner-forms-available-in-banner-9/. A few select forms, such as Time Entry for Payroll, will be available until January 31, 2019. Banner 8 will no longer be supported as of January 31. The decision to extend the deadline was based on concerns expressed by the Banner Service Advisory Board and the need to minimize risk by moving off of Banner 8 as soon as possible. As mentioned in our October update, we encourage Banner users to log in to Banner 9 and familiarize themselves with the new look and feel. Many Banner forms are already available in Banner 9. For an up-to-date list, please visit the “Banner forms available in Banner 9” tab above or go to https://blogs.uoregon.edu/banner9/banner-forms-available-in-banner-9/. In late October and November, Information Services held four campuswide demonstration and Q&A sessions to go over the general differences between Banner 8 and Banner 9, such as the look and feel, navigation, and use of Duck ID to log in. The final such session will take place on Monday, Dec. 3. Log in to MyTrack for details and to register: https://uomytrack.pageuppeople.com/learning/2484. Business Affairs and other units will be offering additional Banner 9 training related to their respective functional areas with more training planned as the Banner 9 transition continues. Training will also be provided for forms related to critical transaction processing as they are available in Banner 9. All Financial Aid forms and more Finance forms launched in Banner 9 on November 27. All Finance and Payroll forms are expected to launch in early December. Human Resources forms are expected to launch by mid-December. Student, Admissions, and Accounts Receivable forms are expected to launch later in December. On October 23, the Banner 9 project took a big step forward when we turned on more than 2,100 Banner forms in Banner 9. That included almost all the Banner forms that didn’t require customization by our developers. An email message went out to all Banner users via the banner-status@lists.uoregon.edu list on October 25 about this change. We encourage Banner users to get into Banner 9 and try it out. For a list of all Banner forms currently available in Banner 9, please visit the “Banner forms available in Banner 9” tab above or go to https://blogs.uoregon.edu/banner9/banner-forms-available-in-banner-9/. Information Services has scheduled a few campus-wise demos and Q/A sessions to go over general changes (UI, navigation, SSO). Log in to MyTrack for details and to register: https://uomytrack.pageuppeople.com/learning/2484. Business Affairs, the Registrar’s Office, Admissions, and HR will be also be providing module-specific training as the transition to Banner 9 continues. In addition, brief videos about how to launch Banner 9, log in, and navigate are now available at https://service.uoregon.edu/TDClient/KB/ArticleDet?ID=46979. Four sets of business processes used by the Registrar’s Office recently launched in Banner 9, on August 23 and September 13. Those included the Degree Guide, Catalog, and Schedule processes. The Schedule process is used broadly across campus, while the others are used internally by the Registrar’s Office. The remaining post go-live issues have been resolved for that collection of work. All Finance and Payroll forms expected to launch in Banner 9 by mid-December. Development is underway on forms for business processes used broadly across campus. Information Services staff and Ellucian outsourced services are sharing that work. In the Finance office, the majority of internal business processes — that is, those used only by that office — transitioned to Banner 9 on August 2. A few issues were reported after the go-live, which Information Services has now resolved. The remaining development on business processes internal to the Finance office will resume in September. All of the business processes internal to the Payroll office transitioned to Banner 9 on August 2. Similar to the Business Affairs transition noted above, the few issues reported after the go-live have been resolved by Information Services. Development on the first set of Student business processes has taken longer than anticipated due to the complexity of the work. User acceptance testing is underway for a subset of the business processes. The launch originally planned for the second week of August moved to August 23 allowing for extended user acceptance testing for the collection of work. We’re in the process of assessing the Schedule (class scheduling) process for Banner 9 and the feasibility of moving to production early September. That will be the very first “external” business process — that is, one used broadly across campus — to go live in Banner 9. The limited-scope engagement with Ellucian to convert a selection of forms from Banner 8 to Banner 9 has progressed into the quality assurance and code delivery phase of this work. User acceptance testing is planned for the last week of August, and if testing completes successfully, we will be able to confirm the timeline for completing this engagement. Planning is underway to align the internal development effort in Information Services with the proposed rollout schedule for the Ellucian conversion work later this fall. Business Affairs has completed user acceptance testing for the majority of its internal business processes — that is, those used only by that office — and is ready to go live with those business processes. Information Services and Business Affairs are working to identify a launch date in July for those processes. The remaining internal Business Affairs processes will be ready to launch after user acceptance testing is complete. Payroll has completed user acceptance testing for all of its internal business processes and is ready to go live with those business processes. Information Services and Payroll are working to identify a launch date in July for those processes. Development on the first set of Student business processes is on track for completion by mid-July. The launch of those business processes is planned for the second week of August. Initial Ellucian engagement: The limited-scope engagement with Ellucian to convert a selection of forms from Banner 8 to Banner 9 has progressed into the development phase of this work. We are anticipating six to eight weeks of development and user acceptance testing before completing this engagement. The “core” offices — those that use Banner most heavily — have been hard at work on the transition to Banner 9. In early February, the Financial Aid office transitioned its internal business processes — that is, those used only by that office — to Banner 9. That included over 100 forms. Information Services has been working to resolve issues that arose in that process before transitioning any financial aid-related business processes that would affect staff outside the Financial Aid office, and before proceeding with any Banner 9 migrations in other functional areas. Business Affairs is currently preparing to migrate several business processes used only by BAO staff. That includes the Check Printing, Check Cancellation, and Chart of Accounts Maintenance processes that we had originally expected to transition to Banner 9 earlier this year. Other processes in the works include Bank Check and Deposit Reconciliation, Buyer Code, and Person/Entity Maintenance. We expect to soon identify the transition date for all of those business processes. The Payroll office has completed user acceptance testing for the Biographic/Demographic and Benefit Administration business processes used by their staff. Once user acceptance testing is complete for the remaining Banner 9 forms for internal Payroll office processes, we will determine a date for transitioning all of Payroll’s internal business processes. The Office of the Registrar has selected which business processes to roll out in August and October. Development work and preparation for user acceptance testing is underway for the August portion of those. Student Services and Enrollment Management recently sponsored an assessment by Ellucian of a few key areas in the Banner Student module for the Office of the Registrar. The results reduced the number of form customizations by one-third, bringing the overall modification reduction level in line with that of the other Banner modules. In addition, Information Services has contracted with Ellucian to convert a selection of forms from Banner 8 to Banner 9. Work is currently underway on prerequisites needed to begin that conversion effort. This limited-scope engagement will be used to determine whether to contract with Ellucian for further conversions. As we mentioned in July 2017, we are organizing the migration from Banner 8 to Banner 9 by business processes. For example, all of the Banner 8 forms related to check printing will be migrated to Banner 9 at one time. 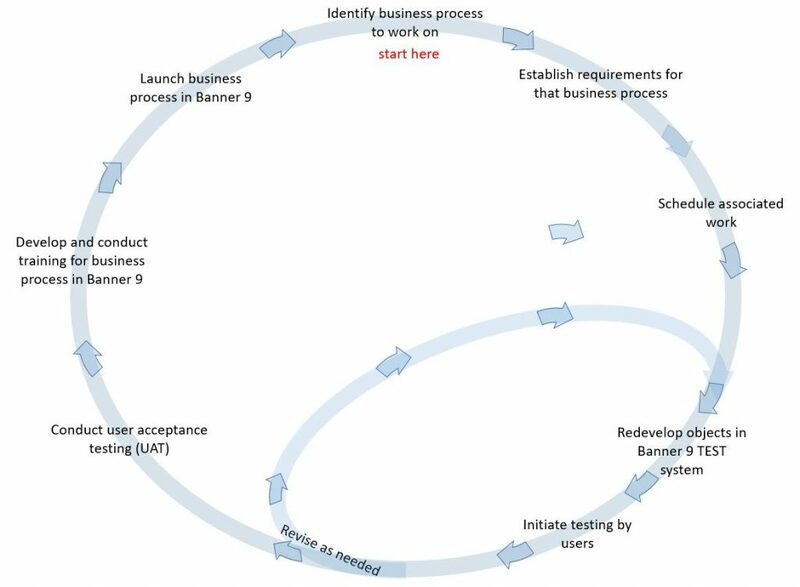 We are starting the migration to Banner 9 with some business processes that are relatively simple and whose migration to Banner will impact fewer people and departments on campus. Before we move a given business process to Banner 9, Information Services (IS) or the stakeholder leads in that area will communicate with staff who are using that process. We will also do testing and allow time for training. Because Banner 9 uses a different programming language than Banner 8, developers in IS must re-engineer Banner 8 forms for Banner 9 if those forms were originally designed or customized for UO. Although our campus partners have helped dramatically reduce the number of modifications that need to be made, there are still a considerable number that will require re-engineering. For the first few business processes to be migrated, the forms have been redeveloped and are now being tested by staff in Financial Aid, Payroll, and Finance to ensure the forms still function as they should. If those testers identify problems, the developers will work to resolve them, continuing the feedback loop until the forms seem ready to go. Once the Banner 9 versions of the forms pass that first round of testing, a larger group of users — in this case, Finance, Payroll and Financial Aid staff — will be invited to perform something called “user acceptance testing” (UAT). The UAT process asks Banner users to confirm that forms are indeed complete and ready to go, and that no further adjustments are needed. User training on the Banner 9 forms will then be offered, and the business process will be migrated to Banner 9. A lot of work continues behind the scenes for the Banner 9 migration project. The developers and other technical teams continue preparing the Banner environment for the migration. The review of modifications to customized Banner forms also continues (see our July project update for more information). Ellucian published several upgrades to Banner 8 that had to be installed prior to Banner 9. Information Services installed those upgrades on September 15-16. The stakeholder leads from each area have been busy identifying the business processes that are currently using Banner 8 and the forms and objects associated with those processes. Stakeholder leads for Payroll and HR determined that it would be best to migrate payroll-related business processes from Banner 8 to Banner 9 in two groups. The first group will include payroll-related business processes that are used only by those two units. The second group will include payroll-related business processes that are used by staff elsewhere on campus. Once those two migrations have been scheduled, we will share scheduling information in this blog. In future updates, we will share a “dashboard” view that will list all of the business processes currently using Banner 8 and indicate the progress toward migrating each of them to Banner 9.